Adam Peaty wowed the Glasgow crowd with a 2018-best 100m breast mark of 57.89 to smash the meet record he set in 2016. Archive photo via Fabio Cetti - ics Media s.r.l. 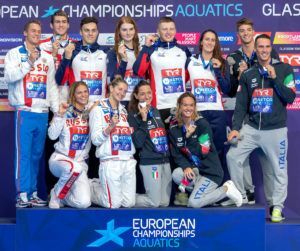 Day 1 of the 2018 European Championships kicked off with a new meet record by the hands of Great Britain’s Adam Peaty. The world record holder and Olympic champion threw down a monster time of 57.89 in the 100m breast prelims, smashing his own championship record of 58.36 from 2016 and setting himself up to do more damage in tonight’s semi-final. 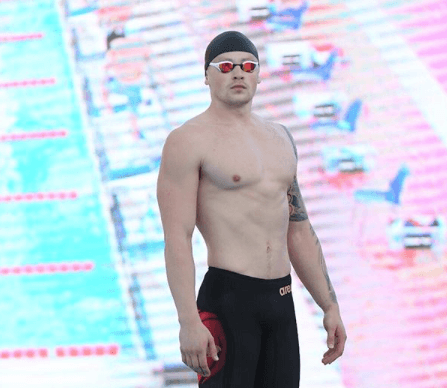 Peaty holds the world record in 57.13, a time produced at the 2016 Olympic Games en route to becoming Olympic champion. The Brit’s fastest this season was the 58.59 he produced at the Commonwealth Games in the semi-finals. He went on to take gold on the Gold Coast in 58.84, so this morning represents his first time under 58 this season. 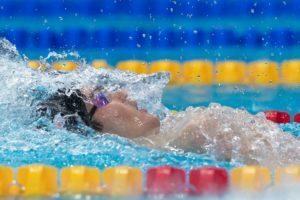 The National Centre Loughborough-trained athlete already held the top 10 performances of all-time heading into Glasgow, but his menacing 57.89 now gives him the top 11 100m breast swims in history. His sub-58 outing this morning ranks as the 7th fastest ever produced. Remarkably, Peaty wasn’t alone in putting the field on notice this morning, as his 2 countryman in James Wilby and Ross Murdoch also nabbed huge times of 59.12 and 59.14 for the 2nd and 3rd seeds, respectively. For Wilby, his time this morning laid waste to his previous personal best, the 59.43 he scorched for silver behind Peaty at the Commonwealth Games. Murdoch’s morning output was also near his career-fastest, just .05 shy of his personal best. Peaty remains as the #1 ranked swimmer in the world this season, while Wilby and Murdoch move up to positions 4 and 5, respectively. 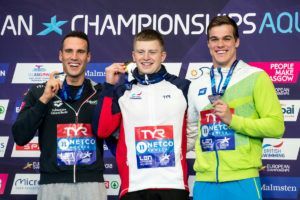 With just 2 swimmers of the same nation able to move on to the next round at these European Championships, Murdoch will be sitting on the sidelines cheering Peaty and Wilby on as they try to go 1-2 for Great Britain. Go to https://m.youtube.com/watch?v=0OtGVlpLClc – they have published the race! 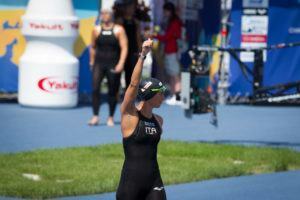 Sjöström and Peaty are easy tips for today.